Intex has today launched another smartphone Intex Aqua i6 which has brought the MT6582 chipset to India with 1.3 GHz Quad core processor. This is the second low cost processor which was announced by MediaTek in its roadmap. We have seen the dual core variant of this processor in MT6572 which has flooded the market in last few weeks and can be spotted in various budget android phones like Xolo A500S. Let’s take a detailed look into the spec sheet of this phone to know how much to expect from this device. The primary auto focus camera has a 8 MP sensor and is supported by LED flash. The press release does not specify anything about the video recording capabilities of this shooter, but the chipset does not support 1080p recording. As far as Megapixel count goes, this is the most you can expect at this price range. A front camera of 2 MP is also present for video recording. The internal storage is trite 4 GB and can be extended to 32 GB using a microSD card. Similar to Intex Aqua i7, this time also Intex will offer you 5 GB of space on the clouds. How useful this will be subjective to individual taste and usage. Over all, no reason to complain regarding these two features on paper. The processor is the highlight of this smartphone. We can expect many more devices in the future with MT6582 quad core priced below 10,000 INR. This processor employs the same power efficient 28 nm process technology we have seen in MT6589 series and is based on power efficient Cortex A7 ARM architecture. The frequency has been scaled to 1.3 GHz and if the quality of cores remain same, then this would mean higher voltage requirement and thus increased power consumption. We will have to wait for some time to actually know how much the performance is increased or decreased. The GPU used is Mali-400MP2 GPU which has 2 cores clocked at 400 MHz (PowerVR SGX544MP in MT6589T is clocked at 357 MHz). However this chipset can support only up to 720p HD resolution and only up to 8 MP of camera. The RAM capacity backing up this processor is only 512 MB which will put a cap on the processing power and gaming ability this chipset has to offer. A 1 GB RAM would have been much better option and would have given us much more to look forward to. The Battery performance is nothing to boast about and is similar to phones like Micromax Canvas 2. Intex Claims that the 1900 mAh batter will give you 6 hours of talk time and 220 hours of standby time. The display is 5 inches in size and sports FWVGA resolution with 854 x 480 pixels which gives you an above average display clarity with 196 ppi. The display will be similar to phones like Micromax Canvas Fun A76 and Micromax Canvas 2 Plus in terms of sharpness and blending of images/text(Not color reproduction and Contrast). On the software front this phone comes with Android 4.2.2 operating system and will come preloaded with apps like Bigflix for movie buffs, Matrabhasha which enables smartphone usage in 22 languages, ZAPAK for games, etc. This phone also supports Dual SIM Dual Standby functionality. The looks of this phone are quite conventional with Metal coloring around the edges and the camera sensor at the back. 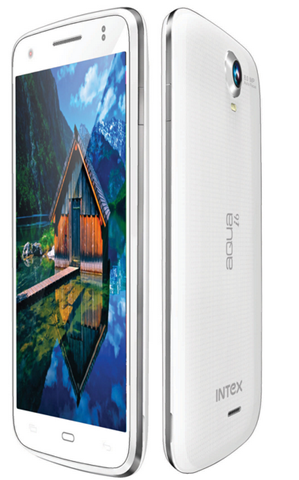 Rest of the back panel has a textured design and Intex branding all over it. This phone will basically compete with Quad core phones present below 10,000 INR which includes phones like Panasonic T11, Xolo Q700 and Xolo Q800. Out of these devices, Intex Aqua i7 will be the only one with a bigger 5 inch display and least 512 MB RAM. It will also compete against MT6572 dual core phones like Micromax Canvas Fun A76 and Lava Iris 503 with large displays. The processor is a quad core but it will be limited by 512 MB RAM. The Display is decent enough and the battery backup is disappointing. For now the other Quad core options seem more alluring. After the price slides, this can be a better option over dual core budget phones with large displays, but for that we have to wait for the competition to arrive. Nice review… Its best phone in this Range..
Its really good smartphone on range under 9000/-.but it will be better if it plays full hd video ease.